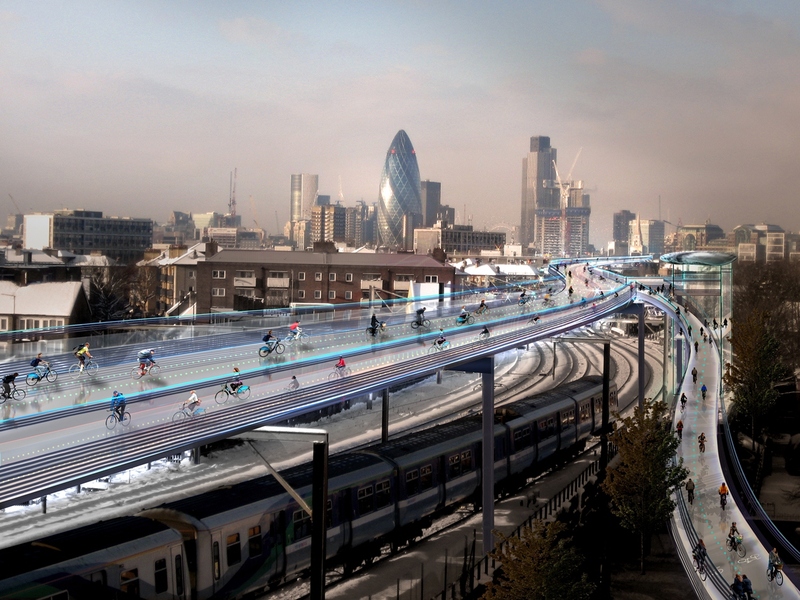 Esteemed British architect Sir Norman Foster has put forth ambitious plans for an elevated cycling lane above the city streets of London, tentatively titled SkyCycle. The “cycle utopia” is inspired by the growing number of cyclists in London. According to Transport for London (TfL), over 500,000 cycle journeys are made every day in the city and Exterior Architecture, the company behind the elevated cycle lane plans, say that number will be over one million by 2020. “The roads in central London and the arterial routes into London are busy enough with cars, vans, trucks, taxis, buses, motorcycles and bicycles – tripling the amount of cyclists in this environment is, to us, a recipe for a lot of tension on the roads & further compromising of cyclist safety,” they say. Stretching 136 miles, the highway will run from Stratford in the east of London through to Liverpool Street in the city center. Costing £200 million, the car-free cycle route would take up to 20 years to complete. Interested companies will review the plans for the highway before an official planning permission application is submitted. It marks the second ambitious car-free route announced in London in recent weeks, where Thomas Heatherwick’s pedestrian Garden Bridge received a significant funding boost.